In December 2016, Microsoft and Qualcomm announced the ambitious plan to put full Windows 10 on ARM processors, emulating x86 apps. The first devices were to use a Snapdragon 835 chipset, and would be made by ASUS, HP, and Lenovo. 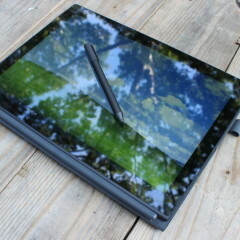 Lenovo's entry is the Miix 630, and I've been using it for about a month. I was excited for it. After all, it's Windows running on a new processor architecture. Who wouldn't be excited about that, right? But just as you should have expected, this is very much first-generation stuff. It actually kind of reminds me of the Lenovo Phab 2 Pro, one of the first Google Tango handsets. The platform is clearly going places, but for now, these devices won't work for the average consumer. The Lenovo Miix 630 comes in at just 7.3mm thick, which is insanely thin for a PC. 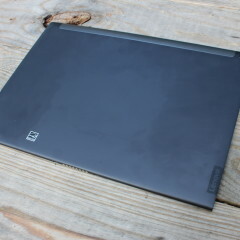 It's a tablet with a fanless design, and it's the ARM chipset that allows for such a slim profile. It doesn't require the thermal designs that Intel chips need. 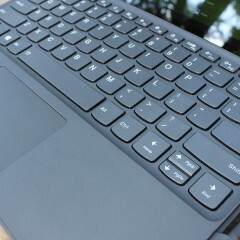 The keyboard adds on another 3.2mm, but this is still an easy machine to carry around. 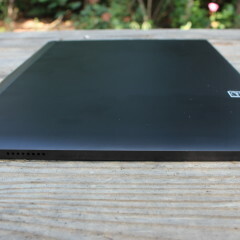 On top of that, the whole package weighs in at just over two pounds, which is lighter than just about any ultrabook. 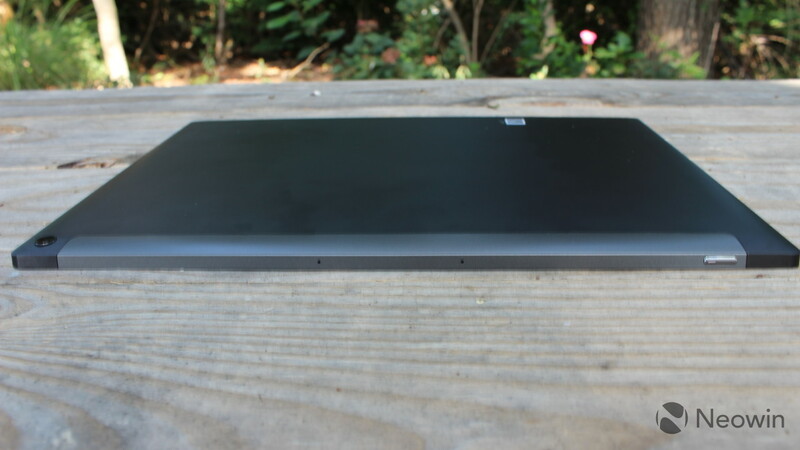 Even Lenovo's ThinkPad X1 Carbon weighs in at almost two and a half pounds. And portability is really a huge factor with the Miix 630, since there are two main selling points to an ARM PC: built-in 4G LTE and battery life, both of which assume that you're on the go. The device doesn't have a lot of ports. 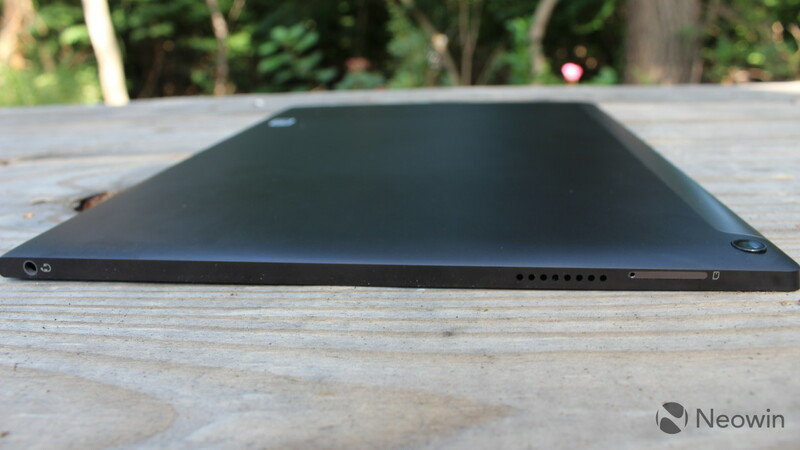 There are no USB Type-A ports, as you'd expect from a device so thin, and there's only one USB 3.1 Gen 1 Type-C port. Unfortunately, you won't be able to connect an external display to that port, not that you'd really want to. There was one point where I tried to. One of the things I tried to do was hook up HP's EliteDisplay S14, which is a 14-inch portable screen that connects via USB Type-C. Rather than sharing the screen with someone to watch a show on Hulu, the plan was for both of us to have our own screens. Sadly, it didn't work. That USB Type-C port is placed on the right side of the device all the way at the bottom. At the top of that side is a volume rocker, and the power button is on top, all the way to the right. On the left side, there's a slot for a nano-SIM card and a micro-SD card, along with a 3.5mm headphone jack. The audio jack is on the bottom is the right side, which is a lot better than devices like the Surface Book that put it on top. You don't need that cord dangling over you. 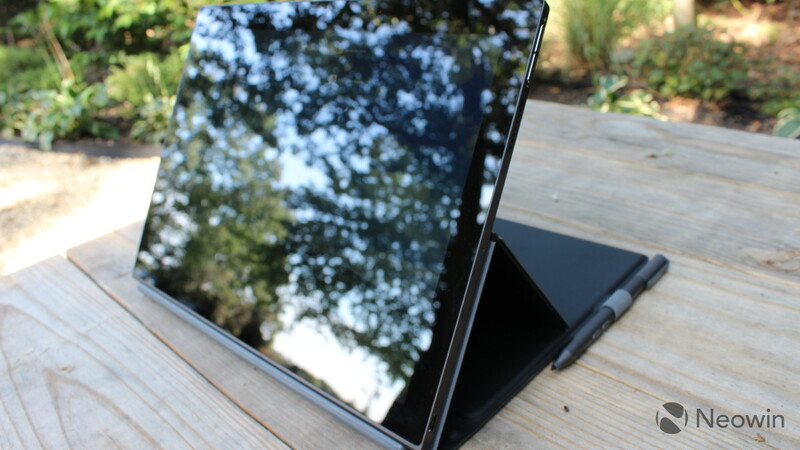 As a tablet, the Miix 630 feels wonderfully comfortable to hold. 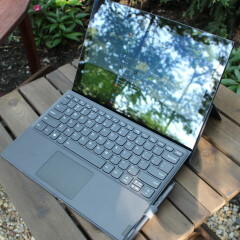 Personally, I've never preferred the sharp edges of a Surface Pro, and I think that this works a lot better. The 12.3-inch screen is 1920x1280, which makes it 3:2. I think that this aspect ratio is fine for a tablet. It's a bit taller than a 16:9 laptop, but it makes it feel more comfortable if you hold it in portrait mode. 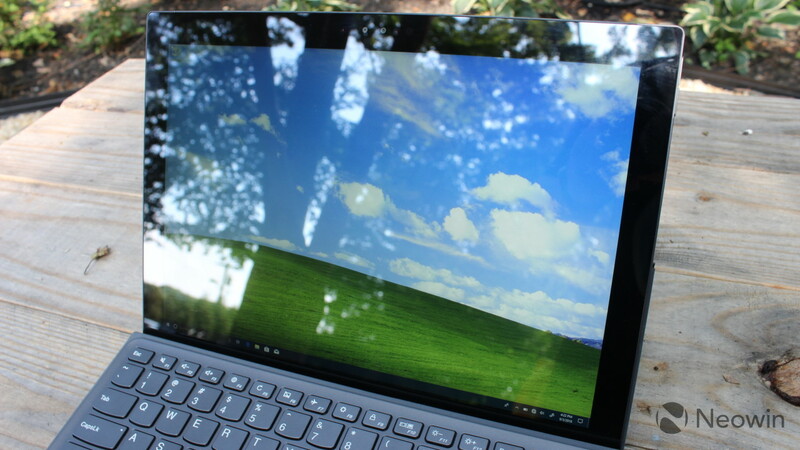 This is also the aspect ratio that Microsoft uses on all Surface devices. The screen looks premium, with bright and vivid colors. I never had any problems with it, although it is pretty glossy so that might be an issue in direct sunlight. I found it ok with the brightness turned all the way up though. One thing I want to note is that the Miix 630 has pretty large bezels, something that really stands out in the age of edge-to-edge screens. In fact, the top bezel is even bigger than the bottom one, which feels awkward. Usually, the bottom bezel is a bit larger to prop up the display a bit higher. The top bezel does house an IR camera for Windows Hello, which is awesome. 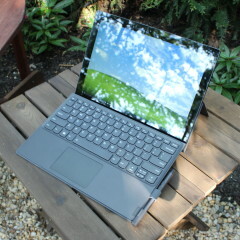 Much like a Surface Pro, the keyboard also serves as a cover for the device. 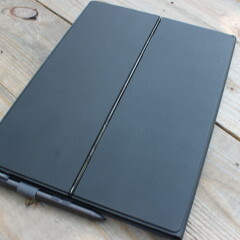 In this case though, it also serves as the device's kickstand and pen holder. The kickstand folds down from the top, and I actually like this implementation because I've never been a big fan of building it into the device. Of course, the big downside to the keyboard serving so many purposes is that it puts you in a really awkward spot if you hate the keyboard. 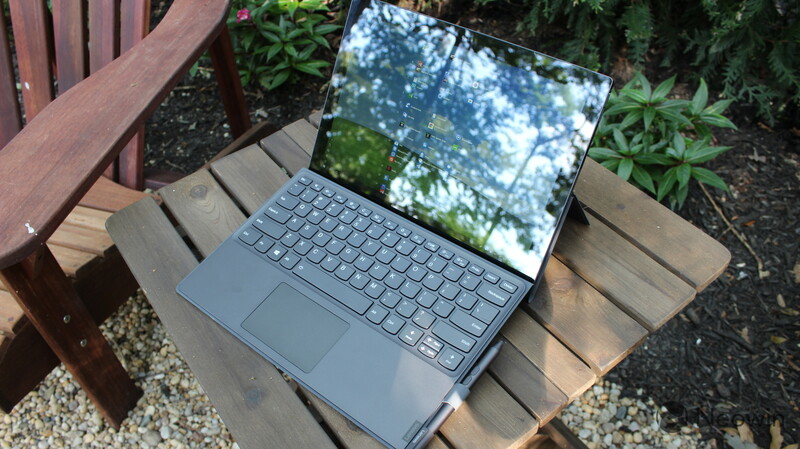 For example, with a Surface Pro, you don't actually need a Type Cover, as any Bluetooth keyboard will do. The same applies here, but if you use a Bluetooth keyboard instead, you won't have a kickstand. 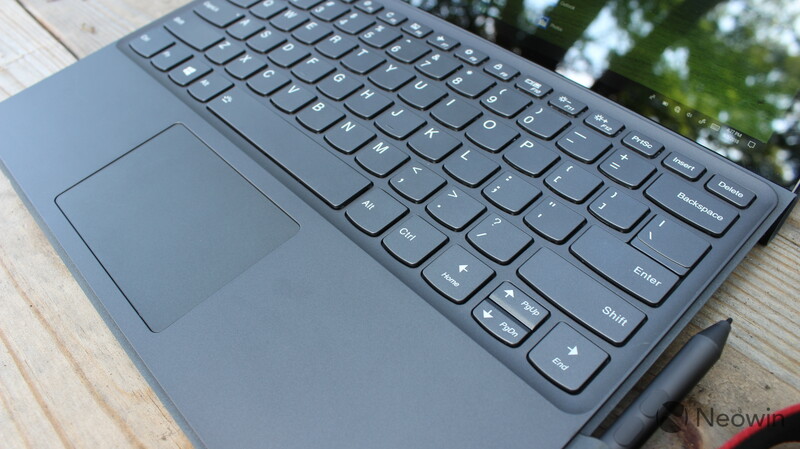 Ultimately, the keyboard is the same as one of Lenovo's consumer laptops, which is to say that it's very comfortable to type on with 1.3mm of key travel. You can lay it down flat, or you can prop it up against the tablet. The keyboard was a little buggy, but I don't actually blame the keyboard for that. The whole experience was a bit buggy, and I wonder how it will improve in the Windows 10 October 2018 Update. If it does improve, I'll update this review. What would happen is that I'd start typing and suddenly the focus will be on another window or another part of the same window, so I have to go back and click on the original window I was typing in. It also just misses keystrokes sometimes. These are the little annoyances that would keep me away from buying a PC. Remember, this thing comes in at $899.99, so it should be pretty good. I really have nothing good to say about performance. I have high hopes for the platform, and I appreciate the fact that first-gen products need to exist, but I don't think that this is a machine that you can bring around for work. 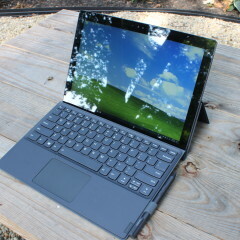 In my time using the Miix 630, I used it in S mode for two weeks, and then out of S mode for two weeks. Either way, the experience is pretty rough. Even Microsoft's own Edge browser has some real lag. If you've ever been typing and you can watch the delay from the key press to when the character appears on the screen, then you know what I mean. Here's what works: Office apps, mobile games, and entertainment apps. I played games like Asphalt 8, Halo: Spartan Strike, and Temple Run: Brave (I had to do Temple Run: Brave, as that was the game that made me realize that the Surface RT couldn't do the most basic of things), and didn't have any issues at all. I also watched TV shows on Hulu, movies on Netflix, and so on. The problem is that there isn't actually a good browser to use, and that's a huge problem. I think that most of us spend a significant amount of time in the browser, so even with Office apps, games, and entertainment apps, you'll still need a browser, no matter what the use case is. It's also worth noting that there's no support for x64 apps. If you download a UWP app, that's running ARM native, as UWP apps are compiled for x86, x64, and ARM. Apps made from the Desktop App Converter are x86, and those will run in emulation. Apps like Photoshop Elements won't even download from the Store because that's x64-only. While this is a shortcoming of the platform, you probably won't want to run anything that's x64-only on this anyway. Microsoft did release an ARM64 SDK, which will allow developers to compile their apps natively for Windows 10 on ARM devices. Unfortunately, it seems like this hasn't been widely implemented yet. I was unable to run benchmarks on this machine. I tried downloading AnTuTu from the Microsoft Store and PCMark 8, but both of those crashed when I tried to run them. Most of the companies that I talked to about their Windows 10 on ARM devices referred to them as an iPad-like experience. 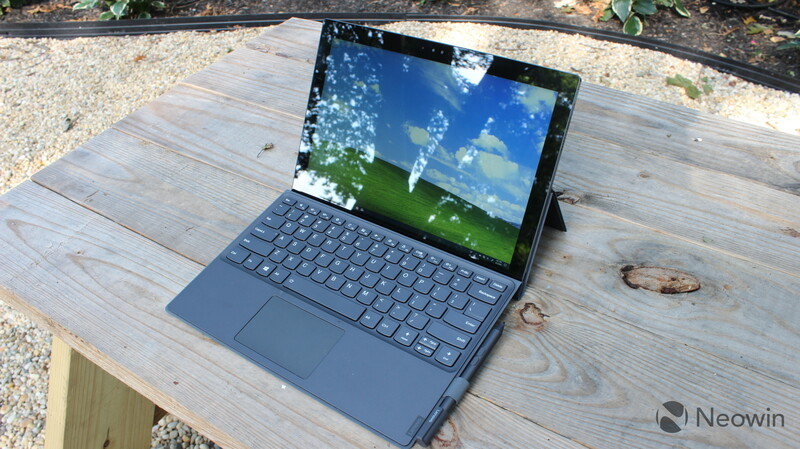 These are meant to be a tablet first and a laptop second. With HP's Envy x2 there's even a different keyboard case for the Intel model that's meant to be more lappable. There's only one problem with this, and that's that Windows 10 isn't very good for a tablet experience. After all, if you want an iPad-like experience, wouldn't you just buy an iPad? They're only $329 now, while this is $899.99. 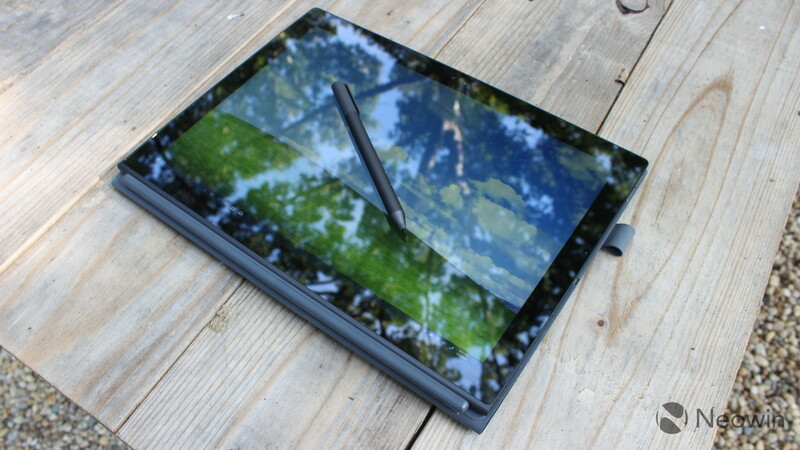 It's not that the Miix 630 is bad at being a tablet. It's actually great at it; it's Windows 10 that's terrible. Operating systems like iOS and Android are built around touch, so they generally work better. For example, if you tap a textbox on Windows 10, it might launch the on-screen keyboard, and it might not. If it doesn't, then you'll have to launch it manually from the taskbar. This has been a problem since Windows 8 and it isn't getting fixed any time soon. Here's another example. When I set up a new Windows 10 PC, I get rid of all of the Live Tiles in the Start Menu. They serve no purpose to me when using a device as a laptop. However, when it goes into tablet mode, the Start Menu opens and I see exactly nothing until I open the All Apps list. These are little inconveniences that just don't exist on native tablet operating systems. There's also, of course, the lack of apps. You'll never get the latest games on Windows, and so on. The Microsoft Store just isn't very good for tablet apps. For example, if you want to read your Amazon Kindle books on this, you'll need to switch out of S mode and get the desktop Kindle app, and you'll need to watch your Amazon Prime videos through a browser. This isn't an optimal experience when there are native apps on other platforms. For things like Netflix and Hulu, or playing mobile games, this thing is great. The audio quality is pretty good, even if it could be a little louder. The tablet apps that are there work well. It's the lack of apps, and the OS surrounding those apps that need work. 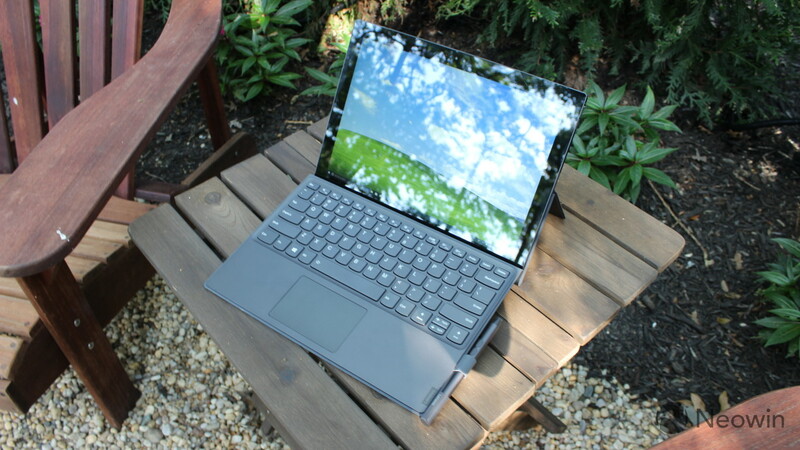 Hopefully, as the experience starts to get better with Windows 10 on ARM, we'll start seeing proper laptops with the chips, and we can go back to quietly ignoring the terrible Windows 10 tablet experience, just like Microsoft is doing. 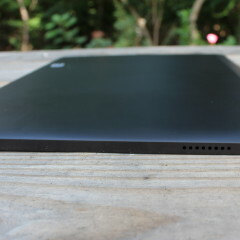 The Lenovo Miix 630 is an Always Connected PC, meaning that it's always connected to the internet via 4G LTE. The Snapdragon X16 cellular modem is embedded in the Snapdragon 835 chipset, so theoretically you could achieve 1Gbps download speeds. 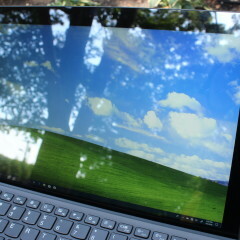 This is also an advantage for Windows on ARM, as Intel PCs with cellular always come at a premium. But there are indeed Intel PCs with cellular modems, and they're great. 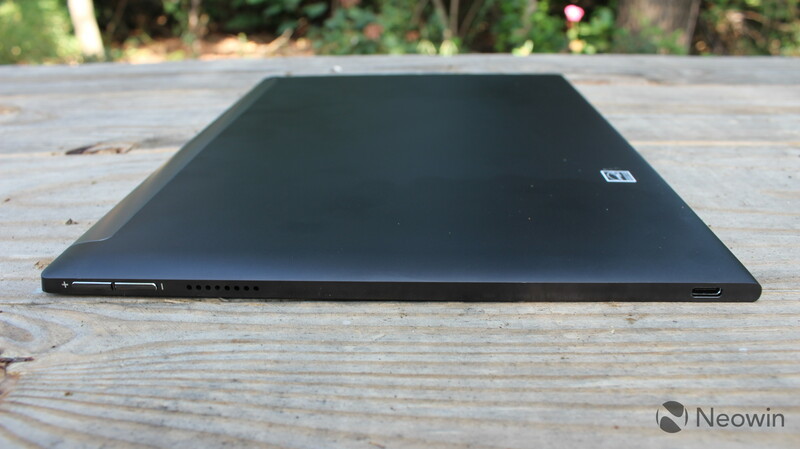 I reviewed one a couple of months ago, the HP EliteBook 840 G5. 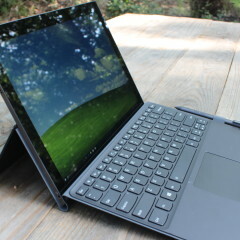 Lenovo makes Intel-based cellular PCs as well, such as its ThinkPad X1 lineup. The only reason that I bring this up, is because I'm still not sure why someone would pay $899.99 for the Miix 630, as 4G LTE isn't exactly an exclusive feature. I will say, however, that cellular connectivity in a PC is life-changing. It's absolutely wonderful to be able to sit in an airport and work without worrying about connecting to Wi-Fi, of if the shoddy network will suddenly drop as you're saving your work. It's also nice to be able to go to a friend's house and not have to ask for their Wi-Fi password, and the same goes for a meeting in another office. I realize that the budget-conscious answer to this is to use your phone as a hotspot. But come on, no one wants to go through that hassle of setting up the phone, connecting to the phone, and so on. This is 2018; shouldn't all of our devices be connected to the internet all of the time? And if you're worried about the bill, Sprint is giving away free service. Another cool feature about Windows 10 on ARM that Intel can't match is the time it takes to wake up the PC. The Miix 630 wakes up more or less instantly, so you don't have to wait for it like you would with an Intel PC. The Snapdragon 835 uses big.LITTLE technology, using four cores for power-intensive tasks, and four, less powerful cores for those tasks that don't need as much power. This means that it can use those more efficient cores while the machine is in standby. The other value proposition to Windows 10 on ARM is battery life. First of all, don't get too excited, because active battery life isn't that much better than an Intel PC. After all, Intel has done a pretty good job of optimizing its chips over the last few years. 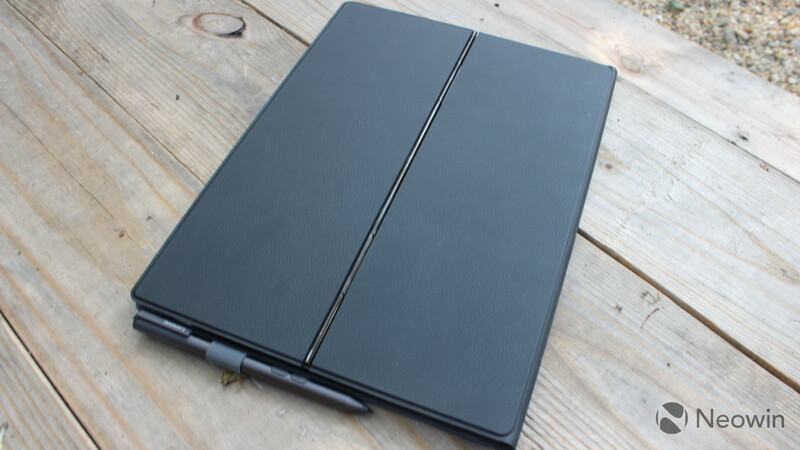 But yes, you'll definitely get a full day of use out of the Miix 630, if not more. When you hear people talking about weeks of battery life, that likely includes a lot of standby time. 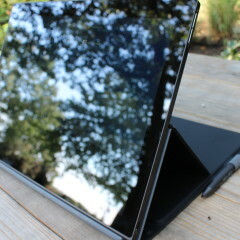 The really cool thing about the Miix 630 is that you really don't have to worry about powering it down. The Snapdragon 835 is so efficient when in standby, that it's really only sipping power. That's the other thing that makes the experience 'iPad-like'. You press the power button, and the screen wakes up right away. With Windows Hello facial recognition, it sees you and you're logged in. It's one of those things that doesn't sound like a big deal, but it's just so convenient when you're using it. Another thing I'll say about the battery life is that it's consistent. With an Intel PC, it all depends on what you're doing. You might get a full day of use while watching videos, and then it only lasts two hours when you're doing real work. With these ARM PCs, you'll always get a full work day out of it, although that could possibly be because you won't be running those power-intensive apps like Adobe Premiere Pro. 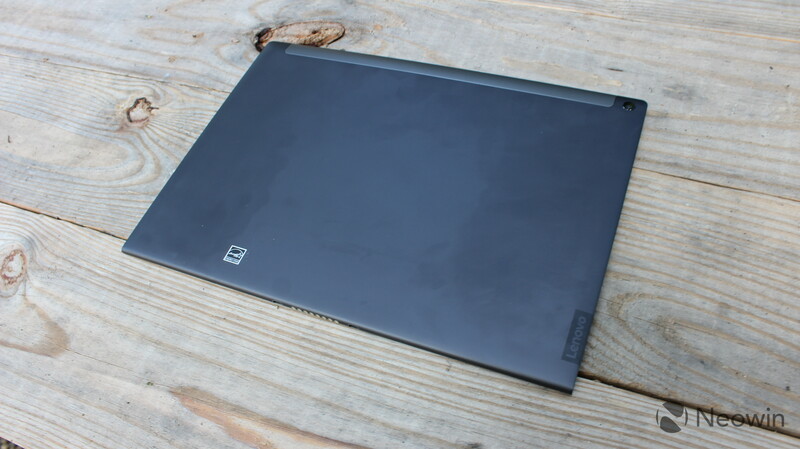 I'm just going to say it: you probably shouldn't buy the Lenovo Miix 630. It fills me with excitement and hope for the potential of running Windows 10 on a new architecture, but that doesn't mean that you should shell out your hard-earned money for this. 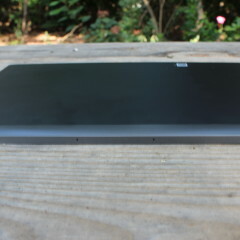 The last PC from Lenovo that I reviewed was the Flex 6 14. 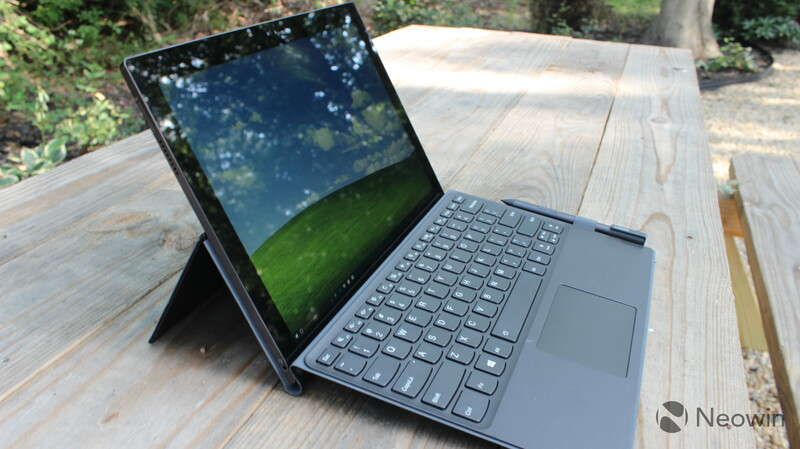 That was a convertible PC that costs $100 less, and has double the RAM and double the storage of the Miix 630, and it has an eighth-generation Intel Core i5. The point is that it's just hard to justify any PC that comes with 4GB RAM and 128GB storage for $899.99, let alone one with the performance issues of the Snapdragon 835. What you do get is 4G LTE connectivity and great battery life, but I really don't think that's enough to justify the purchase. This feels much more like a proof of concept, like the Phab 2 Pro that I shouted out in the very beginning of this review. Microsoft needed partners to show that full Windows 10 can run on an ARM processor, and it has done that. Later this year will be the Snapdragon 850 PCs, and those promise a 30% increase in performance. I don't know if that will be enough, but this platform should continue to get better over time. Unfortunately, that time is not now.